Everybody dreams of having a beautiful green space in their homes. But what’s greater than having a garden that you can both enjoy and use? In the domain of soilless culture, the nutrient film technique system (or NFT system) is also fairly popular with hydroponic growers due to its simple yet effective design. The nutrient film technique is often used to grow smaller and quick growing plants like different types of lettuces. Apart from lettuces, commercial growers also use this system to grow herbs baby greens and strawberries. Nutrient Film Technique is a versatile and familiar hydroponic system that include components the same as Ebb and Flow but different in configuration. Let’s find out more about this technique. WHAT IS THE NUTRIENT FILM TECHNIQUE (NFT)? There are various ways to design a nutrient film technique system; however, all of them take after the design of a very shallow nutrient solution pouring down through the tubing. The bare roots of the plants will absorb the nutrients in the solutions when they come into contact with the water. The NFT system is similar to the Ebb and Flow technique for one reason: They both use water pumps to deliver the nutrients to your plants. However, unlike the flood and drain mechanics of an Ebb and Flow setup, the NFT system is a constantly flowing one. While systems such as the Wicking or The Kratky Method are passive, simpler to build and easier to run, they don’t provide optimal conditions for plants to grow like the NFT system, which is an active one (meaning they require moving parts to work). HOW DOES THE NUTRIENT FILM TECHNIQUE WORK? In the NFT system, there are 2 main components: the grow tray (or channel) and the reservoir that contains water and nutrients. In the grow tray, there are net pots that contain the growing media (perlite, coconut, Rockwool) to hold the plants and reserve nutrients from the nutrient solution. But in reality, most growers don’t use growing media in the NFT system as the roots have had enough moisture, nutrients, and oxygen from the system. The plant roots grow into a dense mat in the channel and the foliage sits on top, sometimes provided with support by a trellis system. The NFT system uses a pump to deliver water to the grow tray and a drained pipe to recycle the unused water nutrient solution. How does this work? 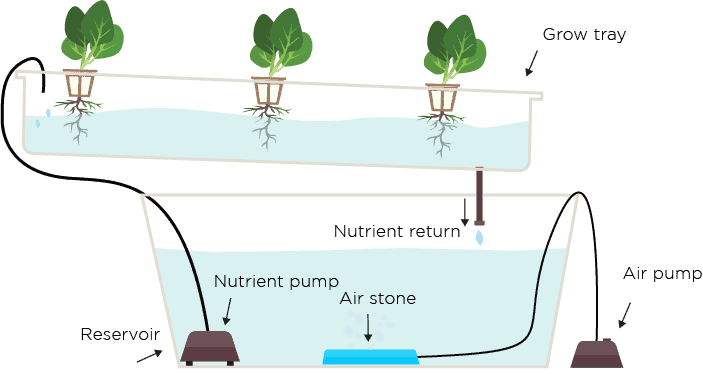 The grow tray is placed at an angle (supported by a rack or on a bench) to let the water flow down towards the nutrient return pipe. The excess nutrient solution will flow out of this pipe and move into another channel or tube, where it is recirculated through the system again. The roots of the plants hang down to the bottom of the channel where they come into contact with the shallow film of the nutrient solution and absorb the nutrients from them. The thin film of the nutrient solution allows the plants to be watered but not entirely soaked. This thinness also allows the upper part of the roots to remain dry and have access to oxygen in the air. The NFT system is best suited to grow lightweight, fast-growing plants that can be harvested quickly like different types of lettuces. People have also grown perennial plants like strawberries in commercial production with great results. If you want to grow heavy fruits like tomatoes or squash, you need a self-standing trellis system to support the plants. The NFT is not suitable to plant heavy crops that require much support because the roots are not in a medium to hold a lot of weight. To enable all of the nutrient solutions to pass through the roots, growers use slightly downward tubes or channels instead of flat trays. Using tubes or channels also make it easy to set the grow tray at an angle. Usually, the channels are made of water-tight materials such as a PVC pipe, plastic film or a round tube. On the PVC pipe, there are holes to fit the net pots and seedlings. These materials are cheap and easy to obtain if you are a hydroponic hobbyist. However, using PVC as the material has one disadvantage: The film will not evenly coat the roots. The roots in the middle will have access to a greater depth of the solution while the roots closest to the edges will only have a shallow depth access. To solve this problem, you should use a flat-bottomed channel. There are two ways to place seedlings. Option 1 is to place seedlings directly into the holes of your PVC pipe or channel. Option 2 is to put seedlings into net pots for greater stability and place them into the holes. Like I mentioned earlier, most growers don’t use growing media in the NFT system. If you decide to use, make sure you don't put much into the net pots for the roots still deep enough to fall through the bottom. Regardless of the seedlings method, you should check and trim the plant roots often to prevent long roots that can clog the system. Another important factor of the grow tray is its length. As the nutrient solutions flow over the roots, the nutrient concentration and the oxygen levels will decrease. This problem can be eliminated by using “short run” trays instead of long ones. “Short run” trays can ensure that the plants at the end of the line receive nutrients with the same composition like those in the beginning of the line. With “long run” trays, you can also avoid this problem by making sure to check the PH and nutrient levels and replenish your solution. If you notice the plants at the end of the line don’t grow as much as the ones at the beginning of the line, it’s time to switch to a short run system. The reservoir joins the grow tray via a nutrient pump on the high end and the nutrient return pipe on the low end. Inside the reservoir, there is an air stone connected to an air pump outside to oxygenate the water. The reservoir is used to contain the nutrient solution since the NFT system is a recirculating one. The reservoir size depends on the number of plants that you want to grow. If you want to grow a system of 40-50 plants, you need a reservoir with a minimum 5-gallon capacity. To grow each additional 20-25 lettuce size plants, you should add a gallon of capacity. It’s advised to have a little more volume capacity than it is needed rather than to be short. 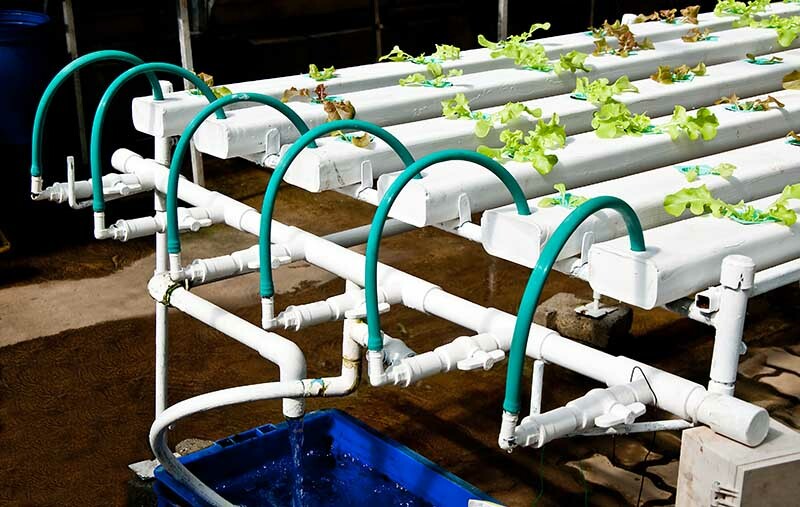 The NFT system doesn’t use an automatic timer connected to the water pump like other hydroponic systems so the water pump runs constantly. This can cause a problem in case of power shortages, outages or system failures, so make sure to check the pump, fill tube regularly and have a backup ready. In a newly planted system, when exposed to intense sunlight, the channels can heat up faster than the root zone would heat in aggregate or Rockwool. However, the continuous flow of nutrient solution does have a cooling effect. The NFT system is a highly easy-to-set-up the system and operate. It’s ideal to grow fast-growing plants that you can harvest in a few weeks. With this system, you can grow various leaves, Bibb and Cos type (Romaine) lettuces, mustard greens, kales, many oriental vegetables, and herbs as well. A few edible flowers such as nasturtiums and pansies, which can be added to enrich salads and food presentations, can also be planted with the NFT system. You can use this system to for quick results and then plant new seedlings for future harvests. This will fulfill the dream of any home hobbyist with a green space and continuous supply of produce.